Billings Boats BIL490 Wasa-3 Mast Warship 1/75 scale wood ship kit! A three-masted royal ship launched in 1627. Length 70.00 m, breadth 11,50 m, draught 4,80 m, displacement 1,400 tons, sail area 1,150 m2, with a crew of 133 sailors and 300 soldiers. 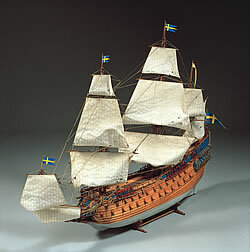 On its maiden voyage in 1628, the Wasa sank in the Stockholm harbour. Using a primitive diving bell, 53 of the ship’s 64 cannons were salvaged in 1664. The ship itself was lifted from the sea on 24th April 1961, and the Wasa Museum was opened the following year.